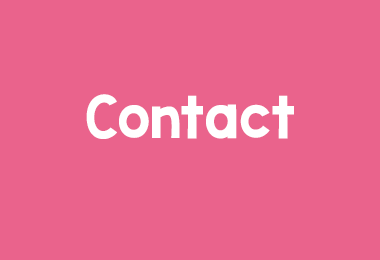 **This post may contain affiliate links, which means if you purchase something through one of my links, I may receive a small commission with no extra cost to you. 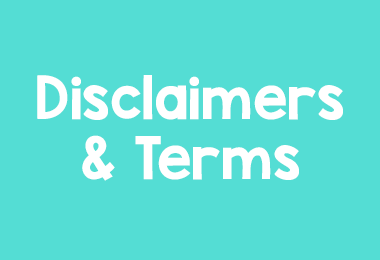 For more information, see my disclosures here. 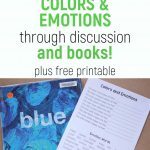 The book Blue by Laura Vaccaro Seeger is a beautiful book that lends itself perfectly to an open discussion and teaching colors and emotions to kids. Grab a copy of the book, the free printable worksheet below, and your favorite craft supplies, and get ready for a fun activity with your kids. It’s time for another Simple Fun with Books (if you’re not familiar with this series, this post describes it). Blue by Laura Vaccaro Seeger is only 32 words long (yes, 32 words), but it packs a huge emotional punch. 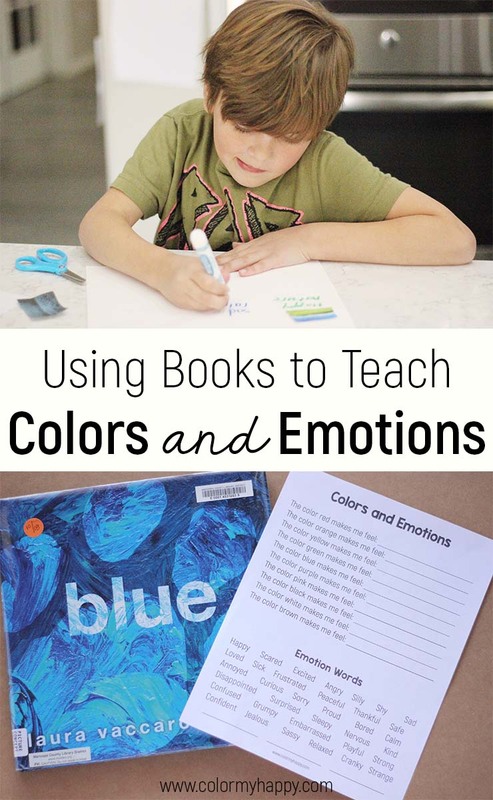 This book shares the various experiences and emotions that come from the color blue. It also follows the relationship between a kid and his dog. The dog does die at the end, so this is a good book to share with kids after the loss of a pet. But the loss is pretty subtle and not stated outright, so you can also breeze past that aspect if you don’t think your child is ready for that discussion. I came up with two activities for this book. Both are super easy and require hardly any prep work, but my kids loved them both! The first activity lends itself more to teaching and opens up a really fun parent/child discussion. Talk with your kids about different emotions and how colors can make us feel a certain way. Use this worksheet to help guide your conversation. For younger kids, you can use it as a starting point or fill it in for them. For older kids, you can hand them the worksheet and let them fill it out themselves. You can download your free worksheet here or click on the image below. Talk about different emotions. What do they mean? What do they feel like inside your body? How do you show each emotion? How do the emotions make you feel? What are you favorite emotions? When we’re feeling negative emotions, what’s the best way to work through them? You can also use this time to discuss whether or not it’s okay to feel emotions like anger or jealousy (spoiler alert: It’s always okay to feel emotions! ), and talk about the best ways to deal with them. Because while it’s okay to feel anger toward someone, it’s never okay to hit someone because you’re mad. Or if you’re jealous of someone, you should never steal their toys to make yourself feel better. You can even discuss how these reactions end up making you feel in the long run and come up with better solutions for how to feel negative emotions in a healthy way. 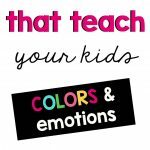 After discussing some emotions, let your kids decide what emotion each of the main colors makes them feel. You might be surprised at what they say! 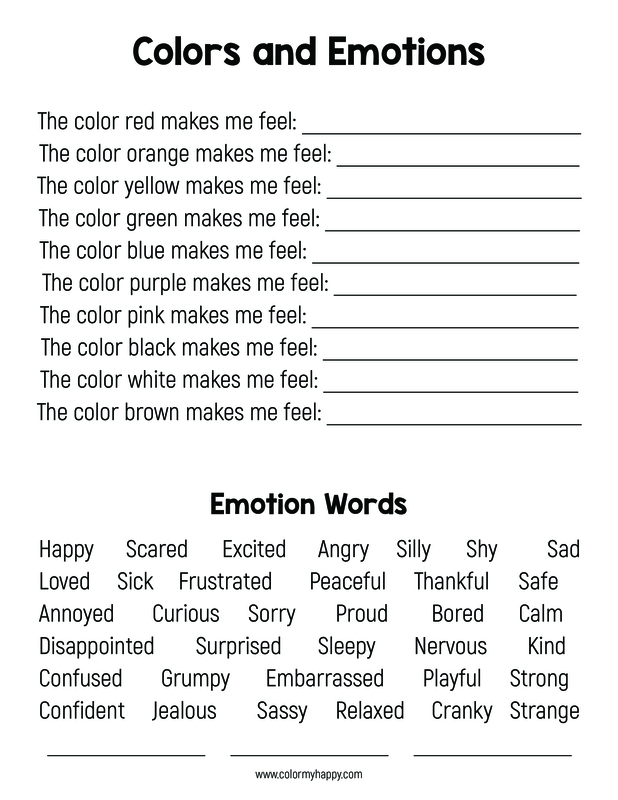 You can use the list of sample emotions at the bottom of the page if you would like (I left a few blank spots to add your own as well), or you can cut that part of the page off and make your kids come up with their emotions from scratch. That’s up to you and what you think your kids are ready for. Next, you can help your kids create an emotions poster board. Have them pick out a color (or two, or five), then cut out pictures with that color that help evoke the emotion that color makes them feel. Old magazines are a great way to find pictures. Then pull out all the craft supplies and let them decorate to their heart’s content, creating a poster that shows the emotion they want to evoke. You can also pull out craft foam or felt, construction paper, crayons, pencils, stickers, or anything else your kids like to create with! 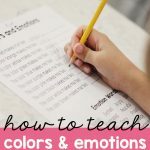 Next time you have relatives over or when Dad gets home from work, have the kids give little reports showcasing their posters and what they learned about colors and emotions. But don’t tell them it’s a report or have them prep for it. Simply say to them, “Hey, you should show Grandma your “excited pink” poster! She’d love to hear all about it!” Then let them share away! Having kids turn around and teach really solidifies the information in their brains and also promotes confidence. I’d love to see you join in the fun! If you do this activity and post about it on social media, tag me @colormyhappy or use #simplefunwithbooks so I can see what you did! What’s your favorite color and what emotion does it make you feel? If you enjoyed this post, share it on social media below! 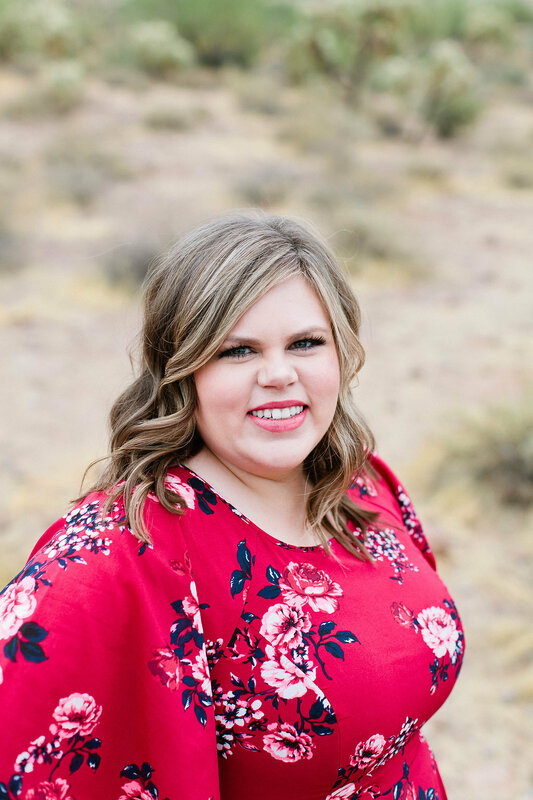 Britney is a wife and mom with a passion for helping other women see the good inside of them. 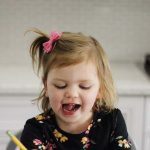 She loves podcasts, polka dots, and dancing around the kitchen with her family. Color My Happy aims to empower moms to find joy in the everyday. Color My Happy is a participant in the Amazon Services LLC Associates Program, an affiliate advertising program designed to provide a means for sites to earn advertising fees by advertising and linking to amazon.com. As an Amazon Associate I earn from qualifying purchases.